A pump is the heart of most irrigation systems and if not maintained can use much more power than required leading to excess pumping costs and wasting electricity. The heart of most irrigation systems is a pump. To make an irrigation system as efficient as possible, the pump must be selected to match the requirements of the water source, the water distribution system and the irrigation equipment. Pumps used for irrigation include centrifugal, deep-well turbine, submersible and propeller pumps. Actually, turbine, submersible and propeller pumps are special forms of a centrifugal pump. However, their names are common in the industry. In this publication, the term centrifugal pump refers to any pump that’s above the water surface and uses a suction pipe. You usually have no choice about the source of the water; it is either surface water or well water, and the local geology and hydrologic conditions will determine the availability. However, the type of irrigation system, distance from the water source and size of the piping system will determine the flow rate and total dynamic head. “Head” is a term commonly used with pumps. Head refers to the height of a vertical column of water. Pressure and head are interchangeable concepts in irrigation because a column of water 2.31 feet high is equivalent to 1 pound per square inch (PSI) of pressure. The total head of a pump is composed of several types of heads that help define the pump’s operating characteristics. The total dynamic head of a pump is the sum of the total static head, pressure head, friction head and velocity head. An explanation of these terms follows and is shown graphically in Figure 1. Figure 1. The total dynamic head (TDH) is the sum of the total static head, total friction head and pressure head. The components of the total static head for a surface water and well water pumping system are shown. The total static head is the vertical distance the pump must lift the water. When pumping from a well, it would be the distance from the pumping water level in the well to the ground surface, plus the vertical distance the water is lifted from the ground surface to the discharge point. When pumping from an open water surface, it would be the total vertical distance from the water surface to the discharge point. Sprinkler and drip irrigation systems require pressure to operate. Center pivot systems require a certain pressure at the pivot point to distribute the water properly. The pressure head at any point where a pressure gauge is located can be converted from PSI to feet of head by multiplying by 2.31. For example, 20 PSI is equal to 20 times 2.31, or 46.2 feet of head. 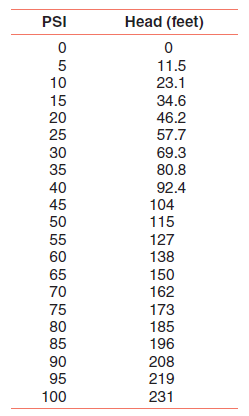 Most city water systems operate at 50 to 60 PSI, which, as illustrated in Table 1, explains why the centers of most city water towers are about 130 feet above the ground. Table 1. Pounds per square inch (PSI) and equivalent head in feet of water. Friction head is the energy loss or pressure decrease due to friction when water flows through pipe networks. The velocity of the water has a significant effect on friction loss. Loss of head due to friction occurs when water flows through straight pipe sections, fittings or valves; around corners; and where pipes increase or decrease in size. Values for these losses can be calculated or obtained from friction loss tables. The friction head for a piping system is the sum of all the friction losses. Velocity head is the energy of the water due to its velocity. This is a very small amount of energy and is usually negligible when computing losses in an irrigation system. A pump operating above a water surface is working with a suction head. The suction head includes not only the vertical suction lift, but also the friction losses through the pipe, elbows, foot valves and other fittings on the suction side of the pump. An allowable limit to the suction head on a pump and the net positive suction head (NPSH) of a pump sets that limit. The theoretical maximum height that water can be lifted using suction is about 33 feet. Through controlled laboratory tests, manufacturers determine the NPSH curve for their pumps. The NPSH curve will increase with increasing flow rates through the pump. At a certain flow rate, the NPSH is subtracted from 33 feet to determine the maximum suction head at which that pump will operate. For example, if a pump requires a minimum NPSH of 20 feet, the pump would have a maximum suction head of 13 feet. However, due to suction pipeline friction losses, a pump rated for a maximum suction head of 13 feet effectively may lift water only 10 feet. To minimize the suction pipeline friction losses, the suction pipe should have a larger diameter than the discharge pipe. noise such as gravel in the pump. The implosion of numerous bubbles will eat away at an impeller and it eventually will be filled with holes. or 2.25 times, and the required BHP will increase (1.5 ÷ 1)3, or 3.38 times, that required at the lower speed. Obviously, with a speed increase, the BHP requirements of a pump will increase at a faster rate than the head and flow rate changes. Manufacturers use tests to determine the operating characteristics of their pumps and publish the results in pump performance charts commonly called “pump curves.” A typical pump curve is shown in Figure 2. Figure 2. A typical pump curve for a horizontal centrifugal pump. NPSH is the net positive suction head required by the pump, and TDSL is the total dynamic suction lift available (both at sea level). All pump curves are plotted with the flow rate on the horizontal axis and the TDH on the vertical axis. The curves in Figure 2 are for a centrifugal pump tested at different RPM. the efficiency line crosses the pump curve lines, that number is what the efficiency is at that point. Brake horsepower (BHP) curves also have been added; they slant down from left to right. The BHP curves are calculated using the values from the efficiency lines. An NPSH curve is at the top of the chart and its scale is on the right side of the chart. When you know the desired flow rate and TDH, you can use these curves to select a pump. The pump curve shows that a pump will operate during a wide range of conditions. However, it will operate at peak efficiency only in a narrow range of flow rate and TDH. 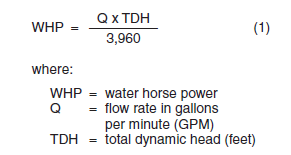 As an example of how to use a pump characteristic curve, let’s use the pump curve in Figure 2 to determine the horsepower and efficiency of this pump at a discharge of 900 gallons per minute (GPM) and 120 feet of TDH. the TDSL at 1,400 GPM is 10 feet, but at 900 GPM, the TDSL is more than 25 feet. Now suppose this pump is connected to a diesel engine. By varying the RPM of the engine, we can vary the flow rate, TDH and BHP requirements of this pump. As an example, let’s change the speed of the engine from 1,600 RPM to 1,700 RPM. 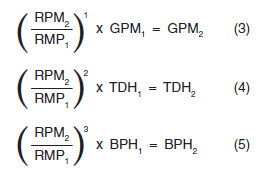 What effect does this have on the GPM, TDH and BHP of the pump? Solution: We will use equations 3, 4 and 5 to calculate the change. Using equation 3, the change in GPM would be (1,700 ÷ 1,600) x 900, which equals 956 GPM. Using equation 4, the change in TDH would be (1,700 ÷ 1,600)2 x 120, which equals 135.5 feet of TDH. Using equation 5, the change in BHP would be (1,700 ÷ 1,600)3 x 37.9, which equals 45.5 BHP. This point is plotted on Figure 2 as the circle with the dot in the middle. Note that the new operating point is up and to the right of the old point and that the efficiency of the pump has remained the same. When you select a pump for an irrigation installation, the installer should provide a copy of the pump curve. In addition, the installer should provide information if the impeller or impellers were trimmed. This information will be valuable in the future, especially if you have to make repairs. Centrifugal pumps are used to pump from reservoirs, lakes, streams and shallow wells. They also are used as booster pumps in irrigation pipelines. All centrifugal pumps must be filled completely with water or “primed” before they can operate. The suction line, as well as the pump, has to be filled with water and free of air. Airtight joints and connections are extremely important on the suction pipe. Priming a pump can be done by hand-operated vacuum pumps, an internal combustion engine vacuum, motor-powered vacuum pumps or small water pumps that fill the pump and suction pipe with water. Centrifugal pumps are designed for horizontal or vertical operation. The horizontal centrifugal has a vertical impeller connected to a horizontal drive shaft, as shown in Figure 3. Figure 3. A horizontal centrifugal pump. Horizontal centrifugal pumps are the most common in irrigation systems. They are generally less costly, require less maintenance, and are easier to install and more accessible for inspection and maintenance than a vertical centrifugal. Self-priming horizontal centrifugal pumps are available, but they are special-purpose pumps and not normally used with irrigation systems. Vertical centrifugal pumps may be mounted so the impeller is under water at all times. (See floating pump on cover.) This makes priming unnecessary, which makes the vertical centrifugal desirable for floating applications. Also, a self-priming feature is very desirable in areas with frequent electrical power outages or off-peak electrical price reductions. Self-priming also lends itself to the new control panels for center pivots where automatic restart is a programmable function. Because the bearings are constantly under water, these pumps may require a higher level of maintenance. Deep-well turbine pumps are adapted for use in cased wells or where the water surface is below the practical limits of a centrifugal pump. Turbine pumps also are used with surface water systems. Because the intake for the turbine pump is continuously under water, priming is not a concern. Turbine pump efficiencies are comparable to or greater than most centrifugal pumps. They usually are more expensive than centrifugal pumps and more difficult to inspect and repair. The turbine pump has three main parts: head assembly, shaft and column assembly and pump bowl assembly, as shown in Figure 4. The head normally is cast iron and designed to be installed on a foundation. It supports the column, shaft and bowl assemblies and provides a discharge for the water. It also will support an electric motor, a right-angle gear drive or a belt drive. Figure 4. A deep-well turbine pump. The shaft and column assembly provides a connection between the head and pump bowls. The line shaft transfers the power from the motor to the impellers, and the column carries the water to the surface. The line shaft on a turbine pump may be water- or oil-lubricated. The oil-lubricated pump has a hollow shaft into which oil drips, lubricating the bearings. The water-lubricated pump has an open shaft. The bearings are lubricated by the pumped water. If pumping fine sand is a possibility, select the oil-lubricated pump because it will keep the sand out of the bearings. If the water is for domestic or livestock use, it must be free of oil, and a water-lubricated pump must be used. 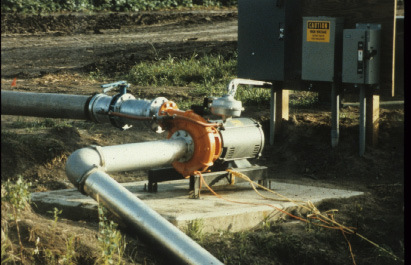 In some states, such as Minnesota, you have no choice; water-lubricated pumps are required in all new irrigation wells. Line shaft bearings commonly are placed on 10-foot centers for water-lubricated pumps operating at speeds under 2,200 RPM and at 5-foot centers for pumps operating at higher speeds. Oil-lubricated bearings commonly are placed on 5-foot centers. A pump bowl encloses the impeller. Due to its limited diameter, each impeller develops a relatively low head. In most deep-well turbine installations, several bowls are stacked in series one above the other. This is called staging. A four-stage bowl assembly contains four impellers all attached to a common shaft and will operate at four times the discharge head of a single-stage pump. Impellers used in turbine pumps may be semi-open or enclosed, as shown in Figure 5 . The vanes on semi-open impellers are open on the bottom and they rotate with a close tolerance to the bottom of the pump bowl. Figure 5. Cutaway view of two enclosed impellers within their pump bowls. The tolerance is critical and must be adjusted when the pump is new. During the initial break-in period, the line shaft couplings will tighten; therefore, after about 100 hours of operation, the impeller adjustments should be checked. After break-in, the tolerance must be checked and adjusted every three to five years or more often if pumping sand. Both types of impellers may cause inefficient pump operation if they are not adjusted properly. Mechanical damage will result if the semi-open impellers are set too low and the vanes rub against the bottom of the bowls. The adjustment of enclosed impellers is not as critical; however, they still must be checked and adjusted. Impeller adjustments are made by tightening or loosening a nut on the top of the head assembly. Impeller adjustments normally are made by lowering the impellers to the bottom of the bowls and adjusting them upward. The amount of upward adjustment is determined by how much the line shaft will stretch during pumping. The adjustment must be made based on the lowest possible pumping level in the well. Tests determine the operating characteristics of deep-well turbine pumps. The characteristics depend largely on the bowl design, impeller type and speed of the impeller shaft. Flow rate, TDH, BHP, efficiency and RPM are similar to those given for centrifugal pumps. Vertical turbine pumps generally are designed for a specific RPM setting. A vertical turbine pump curve is shown in Figure 6 . This pump curve is similar to the centrifugal pump curve, except instead of curves for various RPMs, the curves are for different diameter impellers. Figure 6. Deep-well turbine pump curve. The brake horsepower and total head are for one stage. If the pump had five stages, multiply the brake horsepower and the total head values by five. The gallons per minute will stay the same, no matter how many stages are added. Decreasing the diameter of impellers is called “trimming.” Manufacturers will trim impellers to the proper size to match the TDH and flow rate requirements of a specific irrigation installation. Pump curves for turbine pumps normally are shown for a single stage, so the TDH obtained will be determined by multiplying the indicated head on the pump curve by the number of stages. The brake horsepower requirements also must be multiplied by the number of stages. Note that the flow rate will not change, no matter how many stages are added. As an example, suppose the pump curve in Figure 6 is for a five-stage pump with a 7.13-inch impeller supplying 800 GPM. What would be the TDH and BHP values? portion of the chart. Follow the dashed horizontal line left to where it shows 26 feet of TDH. Multiplying 26 by 5 gives 130 feet of TDH. Next, follow the dashed vertical line from 800 GPM up to the 7.13-inch impeller BHP curve on the lower portion of the chart and then follow the horizontal dashed line left to where it shows 6.5 BHP. Multiplying 6.5 BHP by 5 (five stages) produces a 32.5 BHP requirement for this pump. Also note that the pump is operating at its peak efficiency of 80 percent. At this efficiency, the calculated BHP (equations 1 and 2) is 32.8. Deep-well turbine pumps must have correct alignment between the pump and the power unit. Using a head assembly that matches the motor and column/pump assembly makes getting the correct alignment easy to do. Making sure the well is straight and plumb is very important. The pump column assembly must be aligned vertically so that no part touches the well casing. Spacers usually are attached to the pump column to prevent the pump assembly from touching the well casing. If the pump column does touch the well casing, vibration will wear holes in the casing. A pump column out of vertical alignment also may cause excessive bearing wear. The head assembly must be mounted on a good foundation at least 12 inches above the ground surface. A foundation of concrete (Figure 7) provides a permanent and trouble-free installation. The foundation must be large enough to allow the head assembly to be securely fastened. Figure 7. Recommended concrete base with access pipe for water level measurement and chlorination. The foundation should have at least 12 inches of bearing surface on all sides of the well. In the case of a gravel-packed well, the 12-inch clearance is measured from the outside edge of the gravel packing. A well access pipe at least 1.5 inches in diameter must extend through the foundation into the well casing. The access pipe serves two purposes. The first is to measure static and pumping water levels in the well, and the second is to allow chlorination of the well. A ¾-inch-diameter polyethylene tubing with the bottom end closed, inserted into the access pipe and extending to the pump level will make measuring water levels much easier. Small holes must be drilled into the tubing to allow water to move in and out of the tubing easily. A submersible pump is a turbine pump close-coupled to a submersible electric motor, as shown in Figure 8. Both pump and motor are suspended in the water, thereby eliminating the long drive shaft and bearing retainers required for a deep-well turbine pump. Because the pump is above the motor, water enters the pump through a screen between the pump and motor. Figure 8. A submersible pump installed in a well. The submersible pump uses enclosed impellers because the shaft from the electric motor expands when it becomes hot and pushes up on the impellers. If semi-open impellers were used, the pump would lose efficiency. The pump curve for a submersible pump is very similar to the curve for a deep-well turbine pump. Submersible motors are smaller in diameter and much longer than ordinary motors. Because of their smaller diameter, they are lower-efficiency motors than those used for centrifugal or deep-well turbine pumps. Submersible motors generally are referred to as dry or wet motors. Dry motors are hermetically sealed with a high-dielectric oil to exclude water from the motor. Wet motors are open to the well water, with the rotor and bearings operating in the water. If the circulation of water past the motor is restricted or inadequate, the motor may overheat and burn out. Therefore, the length of riser pipe must be sufficient to keep the bowl assembly and motor completely submerged at all times. In addition, the well casing must be large enough to allow water to flow past the motor easily. Small submersible pumps (under 5 horsepower) use single-phase power. However, most submersible pumps used for irrigation need three-phase electrical power. Electrical wiring from the pump to the surface must be watertight and all connections sealed. The electrical line should be attached to the column pipe every 20 feet to prevent it from wrapping around the column pipe. Voltage at the motor leads must be within plus or minus 10 percent of the motor nameplate voltage. If a 5 percent voltage drop occurs in the submersible pump cable, voltage at the surface must not be less than 95 percent of rated voltage. Because the pump is in the well, lightning protection should be wired into the control box. Lightning striking on wells with submersible pumps is a leading cause of pump failures. You can select submersible pumps to provide a wide range of flow rate and TDH combinations. Submersible pumps more than 10 inches in diameter generally cost more than comparably sized deep-well turbines because the motors are more expensive. Many manufacturers make submersible booster pumps. These pumps usually are mounted horizontally in a pipeline. An advantage of using a submersible as a booster pump instead of a centrifugal is noise reduction. This is a desirable attribute in residential settings and near golf courses. Submersibles also have been used as booster pumps in the suction lines of centrifugal pumps. This application is used in situations where the water level will fluctuate a considerable amount during the season. Having a submersible in the suction line will change the head at the inlet of the centrifugal pump from a suction head to a positive head. Propeller pumps are used for low-lift, high-flow rate conditions. They come in two types, axial flow and mixed flow. The difference between the two is the type of impeller. The axial flow pump uses an impeller that looks like a common boat motor screw and is essentially a very low-head pump. A single-stage propeller pump typically will lift water no more than 20 feet. By adding another stage, heads from 30 to 40 feet are obtainable. The mixed-flow pump uses semi-open or closed impellers similar to turbine pumps. 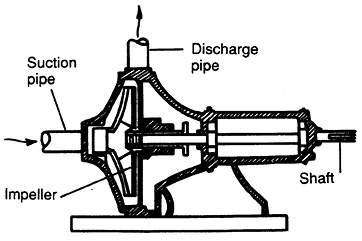 In permanent installations, propeller pumps are mounted vertically, as shown in Figure 9. For portable pumping platforms, they are mounted on trailers or on pontoons for use as floating intakes. Figure 9a. A power-take-off (PTO) driven propeller pump used to move large volumes of water in low lift conditions. Figure 9b. A propeller pump. Portable propeller pumps commonly are mounted in almost horizontal positions (low angles) to allow them to pump into pipelines easily, as well as to be backed into a water source. Portable propeller pumps commonly are powered by the power take-off (PTO) on tractors. On many farms, propeller pumps are used to pump out waste storage lagoons. 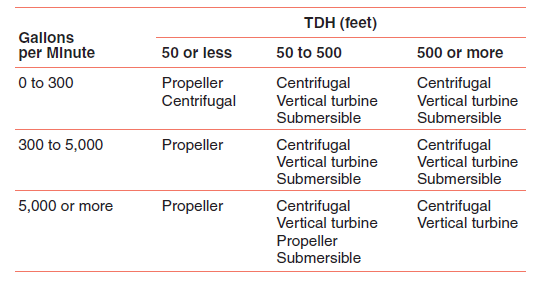 Power requirements of the propeller pump increase directly with the TDH, so adequate power must be provided to drive the pump at maximum lift. Propeller pumps are not suitable under conditions where the discharge must be throttled to reduce the flow rate. Accurately determining the maximum TDH against which this type of pump will operate is important. Propeller pumps are not suitable for suction lift. The impeller must be submerged and the pump operated at the proper submergence depth. The depth of submergence will vary according to various manufacturers’ recommendations, but generally, the greater the diameter of pump, the deeper the submergence. Following recommended submergence depths will ensure that the flow rate is not reduced due to vortices. Also, failure to observe required submergence depth may cause severe mechanical vibrations and rapid deterioration of the propeller blades. The selection of an irrigation water pump is based almost entirely on the relationship between pump efficiency and the TDH the pump will provide at a specific flow rate. As shown before, these parameters also are the basis of the pump characteristic curve. Use Table 2 to narrow the selection of a pump type for a broad range of flow rates and total dynamic heads. One item not included in the TDH values in Table 2 is the suction lift. If your application needs to lift the water to the pump, then you will have to use a centrifugal pump. Table 2. A chart showing the most desirable pump types to use for a given range of flow rates and total dynamic heads. “Care and Maintenance of Irrigation Wells,” an NDSU Extension publication available. “Center Pivot Design,” Irrigation Association, Falls Church, Va.
MWPS-30, Sprinkler Irrigation Systems, MWPS, Iowa State University, Ames.